Woods was tied for the tournament lead early on when he got to three under par after five holes. But he played his last 13 in 10 over and complained that trying to freewheel with a swing that isn’t near to being the finished product was a recipe for disaster. Furious rather than depressed about a day that left him tied for 130th with the likes of 1976 US Open winner Jerry Pate, Woods said: “I’m not down. I’m really angry right now. There’s a lot of words I could use beyond that. “I’ve been in this process before. I’ve been through it with Butch; I’ve been through it with Hank; and now I’ve been through it with Sean. Woods and Harrington were certainly taken to the cleaners by US Ryder Cup skipper Davis Love, 47, who hit a two under 68 to keep 63-shooter Steve Stricker in his sights and remain on course to make his own team at Medinah next year. Harrington was impressed by Love but he nearly missed Woods’ disastrous performance completely after failing to find a toilet before he teed off. On a day to forget for Woods, Harrington confessed that making the cut is now a massive challenge as he must finish on the back nine with the tough closing stretch from the 15th to the 18th a huge hurdle. Harrington said: “It’s a big challenge tomorrow. Anyone who is trying to make the cut would always prefer to be finishing on the ninth. Anybody coming the last four holes trying to play them at level par, you know, either to hold onto a good score or to make the cut or whatever the different prerogatives are at that stage; it’s a tough finish. Harrington’s round began with a shout of “Fore right!” as his three wood at the par four 10th flew into the crowd and finished in the trees. But he punched a brilliant recovery through a narrow gap between two towering pines 50 yards away and then holed a six footer for par after his slick 35 foot birdie chance slipped by. Tiger Woods visited more bunkers than he’d care to remember. Picture by Fran Caffrey/www.golffile.ieWoods birdied from 15 feet there to get his championship challenge off to a brilliant start. In fact, when Woods and Harrington both got up and down from greenside sand for birdie at the par-five 12th, it looked likely that they would finish alongside the leader. But while Woods took longer to implode, Harrington’s day started to go wrong at the 13th when his three wood tee shot skidded through the corner of the dogleg and finished on a sideslope in deep bermuda rough. His third popped up in the air and came up short in a bunker from where he took three to get down. As Harrington scrambled for his par at the 14th, chipping dead from left of the green, Woods hit a huge drive and a towering approach to four feet to grab a share the early lead on three under. But their rounds started to disintegrate at the 253-yard, par three 15th where Woods dumped his tee shot in the lake right of the green and racked up a double bogey. Harrington was short there and missed a six footer for his par to slip to one over for the day. Woods then found two bunkers on the 16th and did well to limit the damage to a bogey that saw him fall back to level par. But they didn’t stop bleeding and endured more pain at the 491 yard 18th with Harrington making bogey after finding sand off the tee and then laying up short of the water in two. Woods racked up a double bogey six there, plugging his tee shot in a fairway bunker before hacking out sideways and then pulling his third way left into more sand. Assessing the closing stretch, Harrington said: “It’s very tough. You know, obviously today, they moved a number of the tees up and it was playable. The 15 was incredibly difficult. I would love to be a spectator and not a player on that one. “I hit it short left of the green and I was happy. You know, I certainly wasn’t disappointed with my tee shot, and I had a 6 or 8 footer for par, and would have been a bonus to hole it there. But the other three holes didn’t play too bad. “The 18th I suppose it did a bit, but we were hitting 5-wood off the tee. So you might have a long second shot but we didn’t take I suppose we didn’t take responsibility off the tee, let’s say. We were conservative. It was a real grind for the Irish world No 69, who admitted that he hit too many poor wedge shots and putted too tentatively to score well. Facing match ball today, he said: “There is a lot of damage done and it is only going to get tougher tomorrow afternoon. The greens are going to be faster again and a little bumpier and there is going to be a little bit of wind. Woods crashed to his worst score in a major since he shot 81 in the third round of the storm-hit 2002 Open at Muirfield. It was also his worst ever opening round in a major. He looked superb early on with birdies at the 10th, 12th and 14th sending him to the top of the leaderboard at three under. But he lost the plot from the moment he dumped his tee shot in the water at the 260-yard 15th and followed a double bogey there with a bogey at the next and another double at the 18th. Struggling off the tee, he visited 12 bunkers and hit water twice as he limped home with four bogeys, a double bogey and just one birdie in a back nine of 40. Harrington said he tried not to look as Woods hacked his way around Atlanta Athletic Club, explaining: “You try not to get into it too much of what another player is doing, especially if it isn’t going well for him. Love joked that he should have the cut off for Ryder Cup qualification this week if he plays well and remains eighth in the US table. 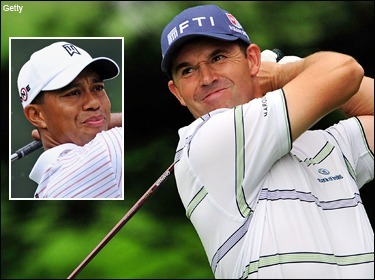 Padraig Harrington needs a good week in the US PGA to guarantee his place in the FedEx Cup play-offs. Picture by Fran Caffrey/www.golffile.iePadraig Harrington insists that this week’s US PGA is his last throw of the dice if he is to qualify for the $10 million FedEx Cup play-offs. Like Tiger Woods, the Dubliner goes into this week ranked outside the top 125 who qualify for The Barclays in New Jersey at the end of the month. But if he fails to earn enough points this week to make it - he has to make the cut at the very least to have any chance of catching 125th ranked Camilo Villegas - he insists won’t to add next week’s final counting Wyndham Championship at Sedgefield Country Club in Greensboro, North Carolina to his schedule.